“çay, çay, çay, çay” are words you will hear all over Istanbul. 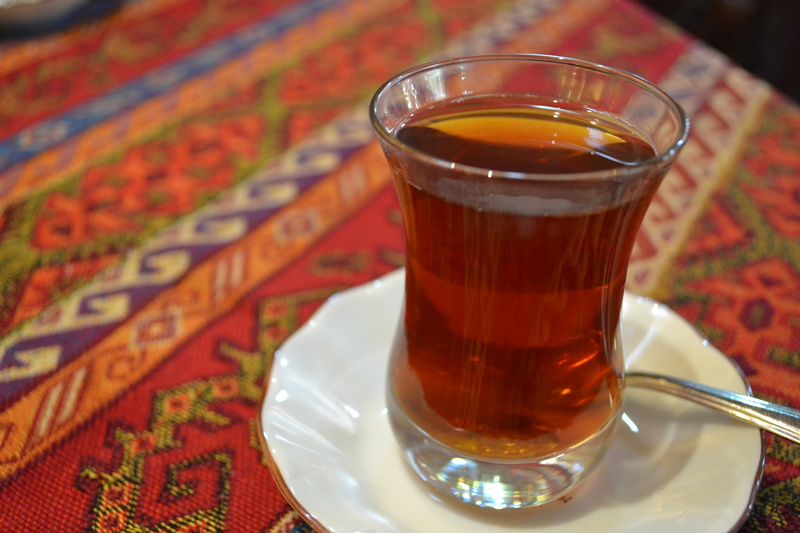 Locals sip Turkish tea all day long; always served very hot with 2 sugar cubes. We stopped at a tea house in Gülhane Park which overlooks the Bosphorous River. 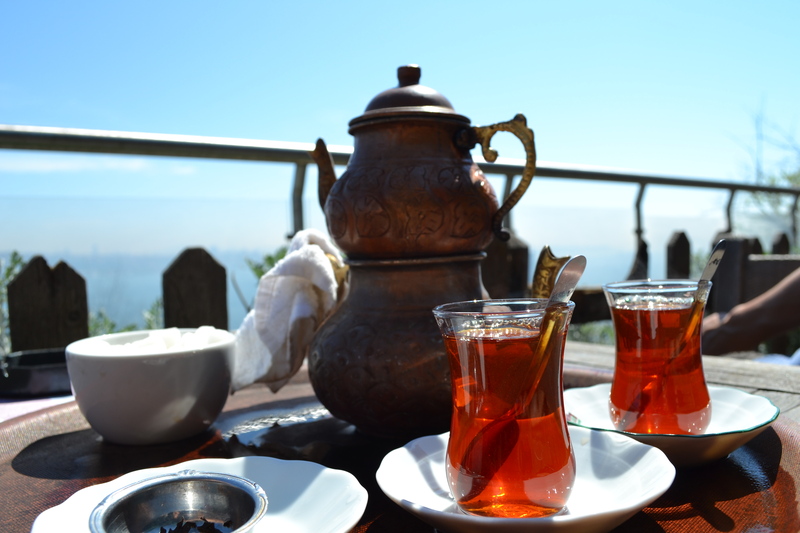 Çay is traditionally served from two kettles, one with concentrated tea and the other with hot water. “Fish Bread” served with lettuce, onion, lemon juice and salt. The best lunch in town for 5TL ($3 USD). 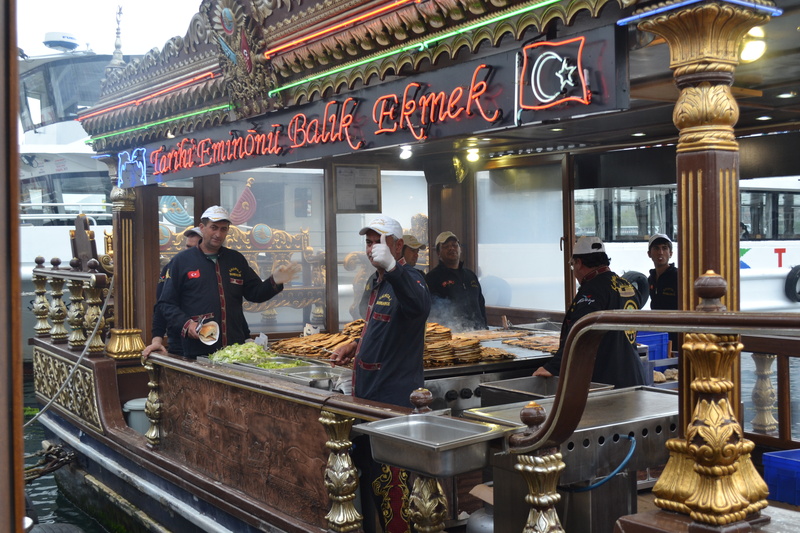 These tasty fish sandwiches are prepared on boats floating near the Galata Bridge. The fish is grilled, deboned, placed in the bread, and handed to the cashier onshore. Once seated with fish bread, you’ll find vendors walking around offering up a variety of extras to complete your meal. 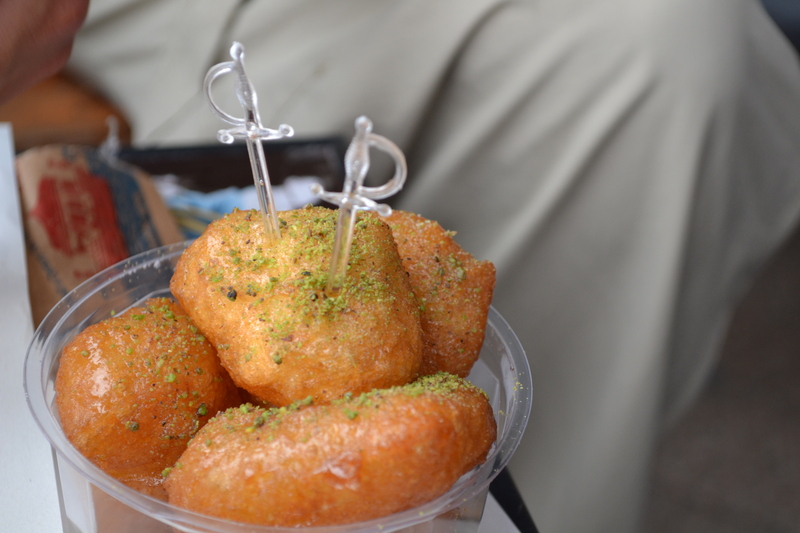 These dough balls are fried, drenched in honey, and sprinkled with ground pistachios. 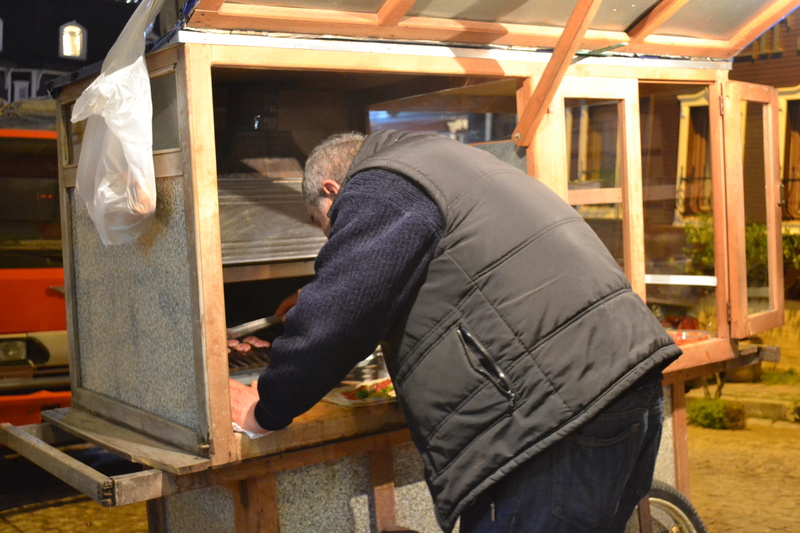 Mr. Foko set up his kebab stand near our hostel in Sultanahmet everyday around 6pm. 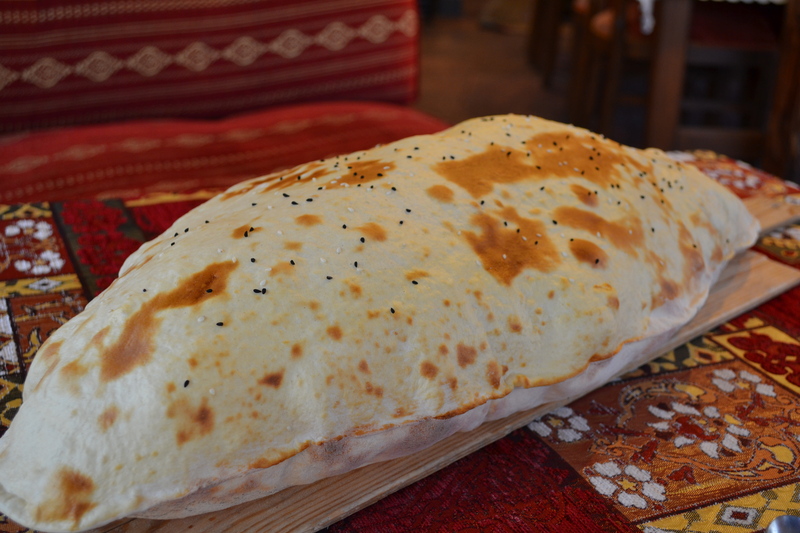 He grilled up spicy chicken, meatballs or lamb and served them in bread or wraps for only 5TL. It is the best and most affordable food in this expensive area of town. 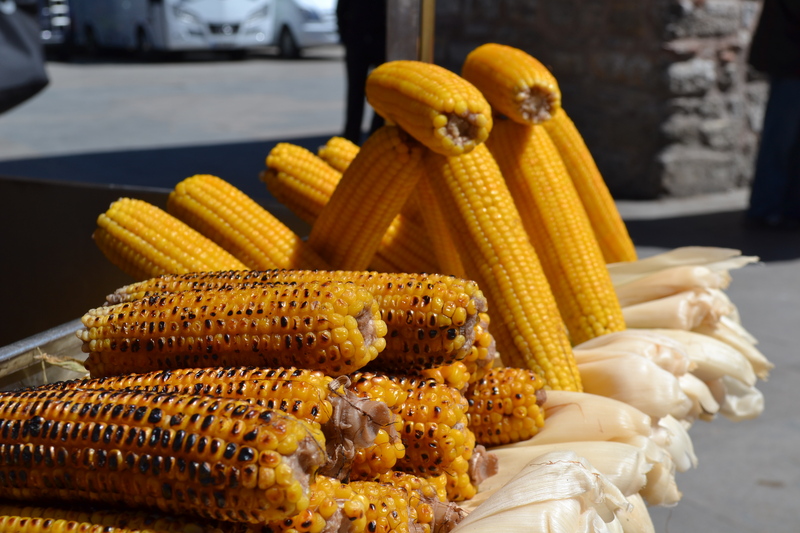 Grilled corn vendors are posted on most streets and squares in Istanbul. The ears come hot (if you insist on one fresh out of the boiling water) and heavily salted. 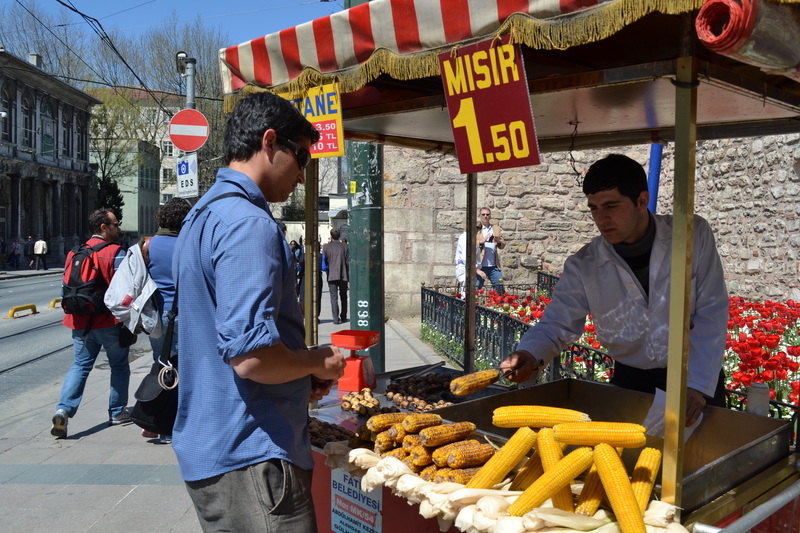 Mike ordering up an ear of corn outside of Topkapı Palace. We vote this the most fun bread served at a restaurant. 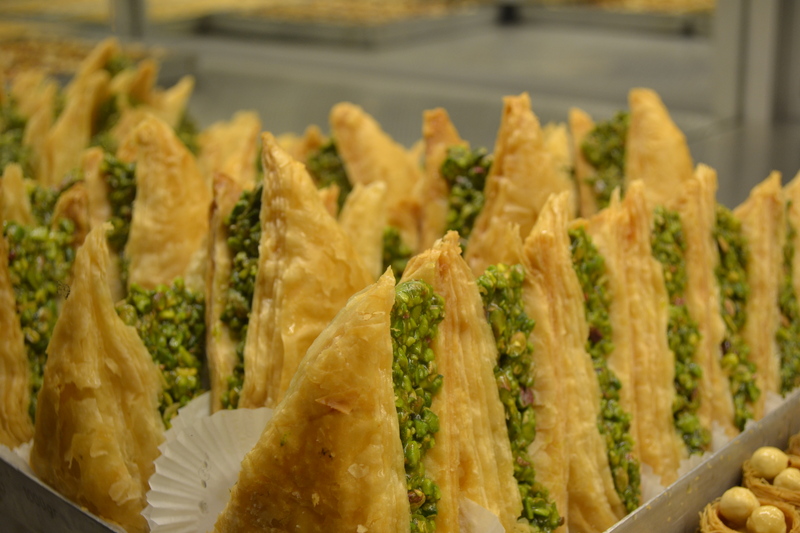 It comes straight out of the oven to your table, puffed up with air and sprinkled with tiny sesame seeds. 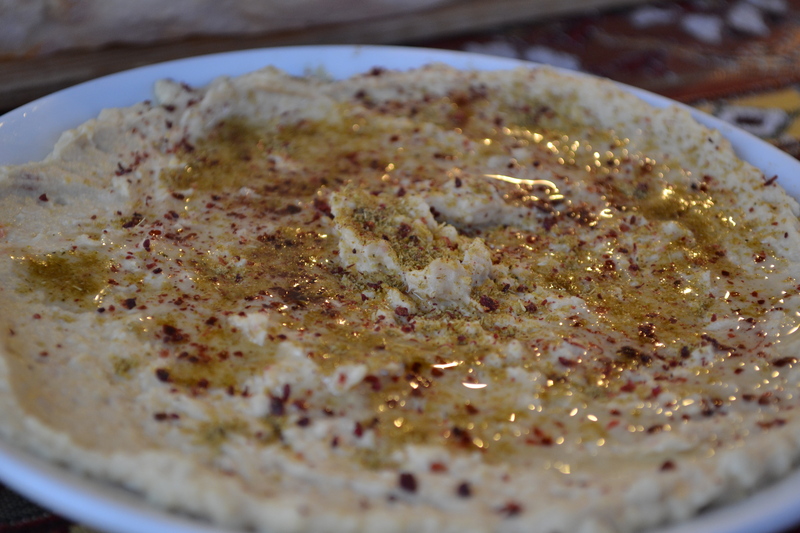 Each dish of hummus we had in Turkey was very unique; ranging from creamy to grainy and with a variety of spices. This photo is of one of favorites and was served with the puffy bread pictured above. Our waiter handed Amy this knife and said “kill him.” It was a very confusing interaction. 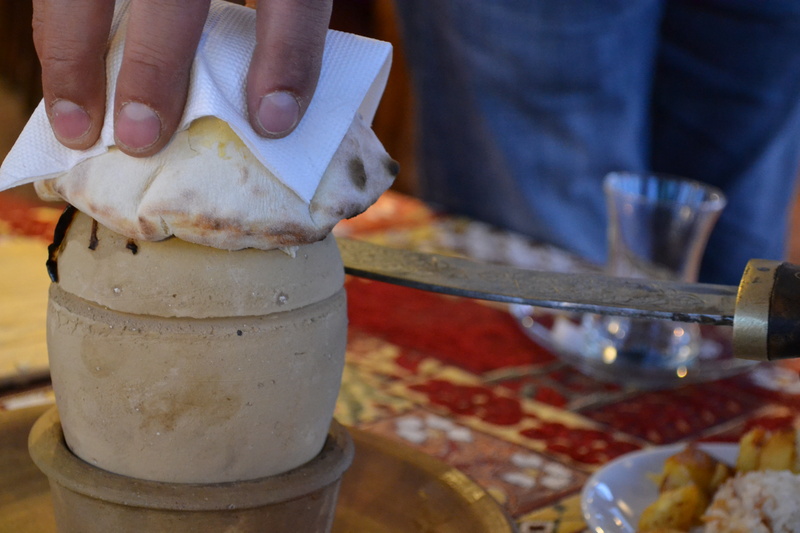 Turns out this is the traditional (or perhaps invented for tourists) way to open up Turkish pottery kebabs. 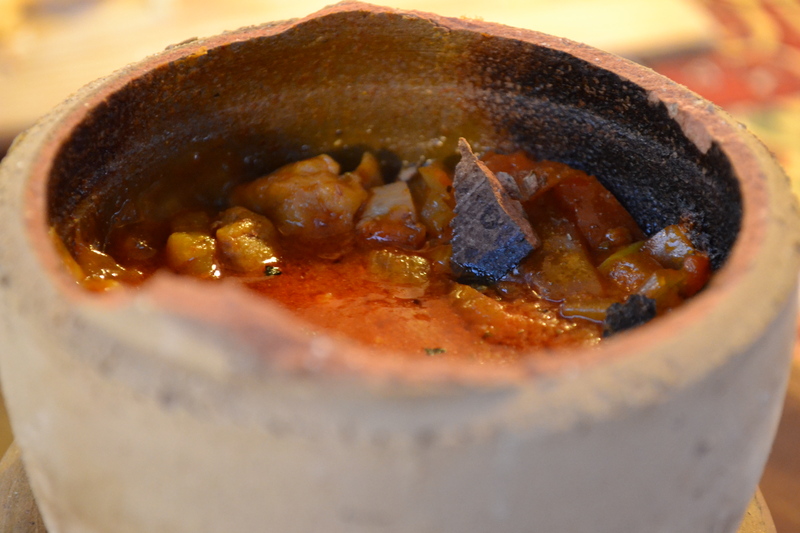 Enclosed clay pots are filled with meat, vegetables and bulgur, covered with dough and put into a fire. Once ready, tapping a few times with a sword opens them right up. Once opened, the bubbling goodness is revealed. But, watch out for chips of clay! 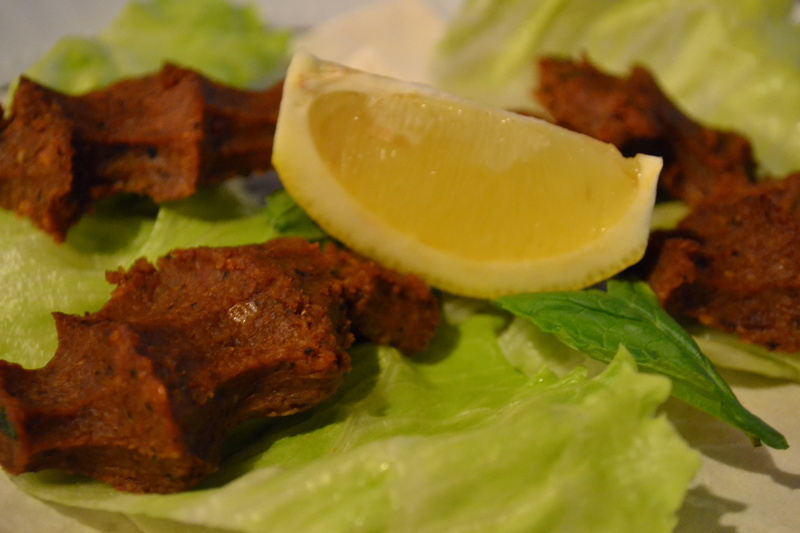 Possibly our favorite Turkish appetizer, çiğ köfte, is made from bulgur, tomato and dried pepper. The dish originally contained ground beef as well, but nowadays is purely vegetarian. Served with lettuce and lemon, it is a great way to start a meal. During our second visit to Istanbul, we found a fantastic local restaurant called Hayri Usta. 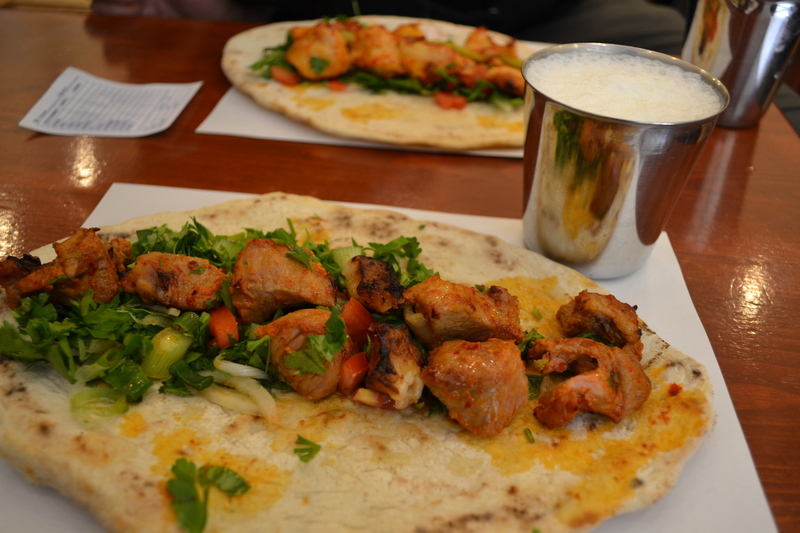 We tried a variety of wraps over our four meals there, and the Adana Durum pictured above was our favorite. The frothy drink is called ayran, which is yogurt water (sounds gross, but is delicious) – a must have with any Turkish meal! 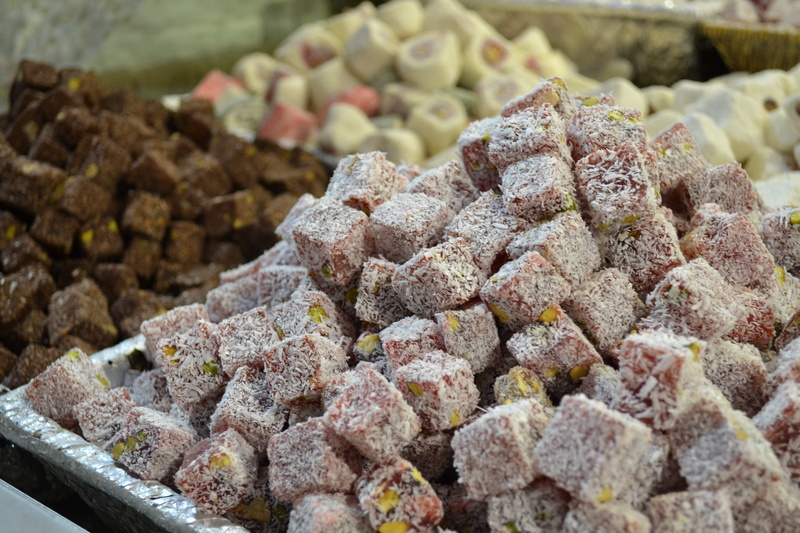 Last but not least, the famous Turkish Delights. There are countless flavors of these delightful delicacies to be found all over the city with the greatest selection at the city Spice Market. I should have listened and eaten first! 왜 난 에미노뉴 생선 샌드위치 밖에 기억이 안날까? Why? I just remember the Eminönü fish sandwich only? Istanbul is a special city. We need an update on your trip to Italy! Amy, love reading your blog…first of all I’m hungry and the food in Turkey looks so good I’m going to have to get something! You guys should sell all your blogs to a travel writer, or better yet, start your own business-what do you think? Love those ideas! Starting our own business has definitely been a topic of discussion during this trip – we’ll see how it all pans out.